Siamese Fighting Fish Betta splendens is a well-known and popular aquarium fish. The species has recently invaded the Adelaide River floodplain, near Darwin in northern Australia. A very large and extensive population has persisted over consecutive years, with potential for further spread. This represents the first serious alien fish species incursion in the Northern Territory, with reports previously limited mainly to livebearers and cichlids in isolated habitats, some of which have been controlled by specific actions reviewed herein. 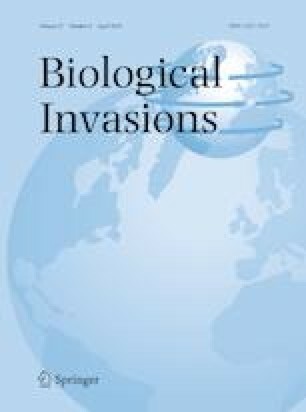 The invasion highlights the need to maintain and strengthen proactive management, community engagement, and coordinated strategies for vectors of introduction including aquarium fishes. The assistance of the Parks and Wildlife Commission NT Ranger team who facilitated access to Fogg Dam and relayed important observations was greatly appreciated, especially David McLachlan. Eloise Wigger, Gavin Dally, Nathan Litjens, Craig Ingram and Matthew and Edward Hammer assisted with field work and lodging specimens. Various NT Fisheries staff contributed with field work, control efforts and reporting including Quentin Allsop, Alex Beatty, Dekarsha Friel, Emily Lawson and Jimmy Maher. Angus Duguid, NT Department of Environment and Natural Resources, provided important information and review of central Australian introductions. Reviewer feedback helped to improve the manuscript. We thank Nathan Litjens and Matt Waites for permission to reproduce their images. Fish sampling was conducted under NT Fisheries permit S17/3301 and Parks and Wildlife NT permit 44005 and 59331, in accordance with Charles Darwin University AEC permit approval A12009.